The Joseph Bellows Gallery is pleased to present the first West Coast solo exhibition of British photographer, Jem Southam. The gallery will feature selections from Southam's series Upton Pyne and The Red River. 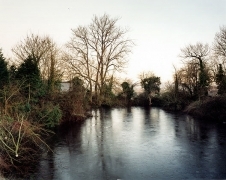 Jem Southam has been an important figure in British photography for over twenty-five years. 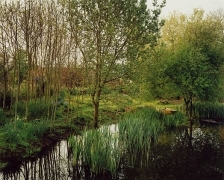 Since 1981, his photographic work has developed through five main series; Bristol City Docks (1977-1984), Paintings of West Cornwall (1982-1986), The Red River (1982-1987), The Raft of Carrots (1992), The Shape of Time: Rockfalls, Rivermouths and Ponds (2000), and most recently, Upton Pyne. 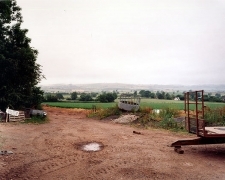 Often working in series, Southam revisits and photographs carefully selected sites over a long period of time. 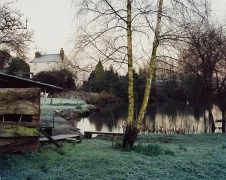 The Upton Pyne series is comprised of fifty photographs and chronicles the life of a property in southwest England over a seven-year period. Organized in three parts, the series tells the story of the evolution of this site. The first part documents one owner's attempt to transform the property into a romantic landscape full of fowl, carefully planted flowers and trees, and well-placed benches for meditation. The second part, records a subsequent owner's efforts to "suburbanize" the rural property by adding garden decorations, picnic tables, and swing-sets. The final part, the Epilogue, looks outward from the property and places the site in a broader geographic context. 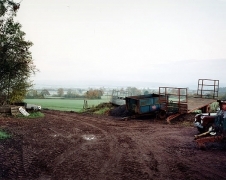 Part traditional landscape photography, part narrative, and part documentary, Southam's photographs reveal the effects of time and man on a specific landscape. Through various owners, seasons, and years, the Upton Pyne property is seen is a constant state of change. Southam's large-scale photographs, with their formal and detailed compositions, allow observation of even the subtlest changes in the earth. 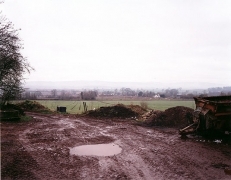 The photographs not only record the visual changes in the landscape but also the experience of that landscape. 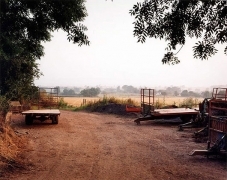 From his photographs the viewer gains an understanding of the history of the property and deep sense of place. 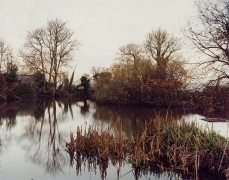 Southam photographed The Red River series from 1982 to 1987. 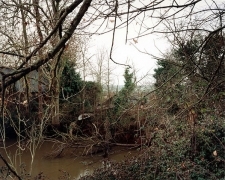 Like the Upton Pyne series, Southam was concerned with recording changes over time, this time along the Red River and in the town of Cornwall. The photographs depict the legacy and history of the tin and copper ore mining in that area. The more archaic landscapes and idyllic scenes of miner's cottages provide an intimate knowledge of the old mining town as it changes. 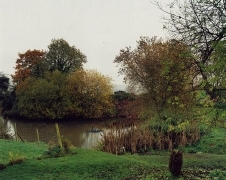 Jem Southam was born in Bristol in 1950. He currently resides with his family in Exeter and is the Head of Design: Photography Department at the Exeter School of Art and Design. His work has been exhibited at the Victoria and Albert Museum, London, Tate, St. Ives, the Royal Albert Memorial Museum, Exeter, Yale Center for British Art, New Haven, and the Johnson Museum of Art, Cornell University, Ithaca among others. His publications include The Shape of Time: Rockfalls, Rivermouths and Ponds (2000), The Raft of Carrots (1992), The Red River (1989), Bristol City Docks (1982), and The Floating Harbour (1981). 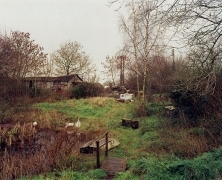 Landscape Stories, the first comprehensive collection of Southam's work, was published in 2005, and most recently, Nazraeli Press published The Painter's Pool in November 2006.